Historic Bed and Breakfast Inn. Convenient to two lakes. Boating, fishing, golfing, hiking or tennis within a few miles of the lodge. Hot air balloon flights and inn-to-inn bicycling, canoeing and walking packages available. Visit nearby flea markets, antique shops or country auctions. Several restaurants in the area. Dartmouth College 17 miles. Cozy rooms with private baths in our antique farmhouse or handsome pine-panelled cottage rooms, (3 with kitchenettes & 3 with working fireplaces). Reasonable rates ($59-$94dbl. occ.) include continental breakfast. AAA and Mobil Travel Guide approved. Color brochure available. 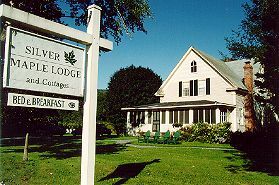 This and other Fairlee Bed and Breakfast Inns can be found here in The Register.